The Ginger Pig 'Hog Blog': The Ginger Pig 100-day chicken and pop-up suppers to celebrate! The Ginger Pig 100-day chicken and pop-up suppers to celebrate! For six months we’ve been driving each week to Rungis market, on the outskirts of Paris, to buy stunning French poultry. With poulet de Bresse, poulet noir and corn fed Landes chickens flying off the blocks of our five London shops, we know that they're popular - quite rightly! - with customers as well as butchers and chefs. Because these chickens are simply outstanding; quite different to poultry produced in Britain, in part due to nature – slow growing, leg-meat heavy breeds not commonly reared in the UK – and in part due to nurture. 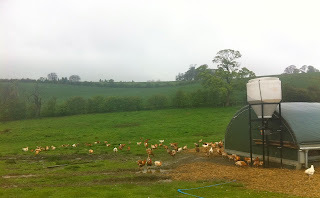 The birds are grown up to a month longer than their British counterparts, from 93-110 days as opposed to just 65 for a commercially grown free range British chicken. They’re leggy, they’re succulent and they’re richly flavoursome. We believe that we produce pork, beef and lamb that is among the best in the world, and so in collaboration with the Botterills of Lings Farm on the Belvoir Estate, we’ve turned our trotters to chicken and started rearing our own incredible poultry. A cross between a Cornish Game cockerel and a Sussex or Dorking hen, our chickens are bigger than your average bird and have been reared outdoors, free-ranging over grass and herbage in the heart of the Belvoir Estate on the border of Lincolnshire and Leicestershire. They’re dry-plucked, hung for a week and labelled as cockerels or pullets (hens) to ensure you can cook them the right way for the tastiest, most succulent meat. Both birds should be cooked low and slow to give great texture, with the cockerels particularly suited to pot-roasting and casseroles, and the pullets producing a fantastic roast. We have - quite literally - spent years getting this right and are delighted to announce that these wonderful birds will be hitting our shops in time for the weekend. Chick chick hooray!!! We've got recipes up our sleeves too, which we'll be sharing on the Hog Blog all week starting this afternoon. Chickens this delicious – as well as the people who’ve worked hard to rear them – deserve a bit of a party, so we’ll be hosting dinners in our Shepherd's Bush and Hackney shops to celebrate the new addition to our marble slabs. Diners will eat their way around these birds through five courses, prepared by our butchers and chefs. I have never been hungrier than I am right now, nor more sad that I will be in another country on Thursday at 10am. oooh can't wait shall keep my eyes peeled! Welcome to the "Hog Blog"
Here you can find out the latest news and information about what is going on at our farms and shops. Please feel free to interact with us and ask any questions you may have.